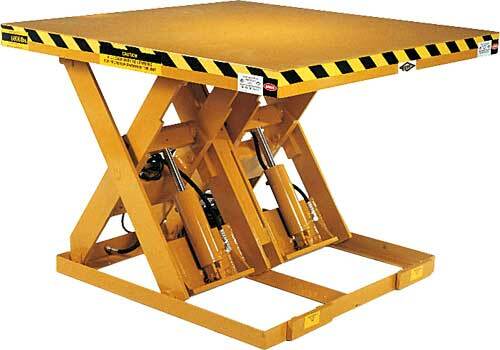 ECOA HLT2DW Series Lift Tables are heavy-duty electro-hydraulic, with double wide scissor legs for applications requiring wider platforms with greater side loading capacity in an extra-wide configuration. Load capacities are 4,000 to 12,000 lbs., travel distances are 24" to 48" with platform sizes of 48" x 36" to 72" x 96". All ECOA Lift Tables are designed and constructed for heavy-duty applications under the toughest working conditions, offering years of trouble-free operation. Oversized platforms, beveled toeguards, roller shades, accordion skirting and electrical tape switches will affect overall size. Power requirements depend upon frequency and type of operation and require specific selection. If available power supply is 115V/1PH/60Hz, a .75 HP motor is required. This will double the upspeed. Internal 3 phase power unit 208V/230V/460 available. Optional Hi-Speed 3HP 208V/230V/460V/3PH/60Hz power unit available. Speeds for Hi-Speed units will be 2/3 greater than speeds specified (multiply by 0.67). Lowered height is 8" minimum for 3HP power unit.